Home > Belt Buckles > Western Buckles > Cowboy Up Buckle - FINAL CLOSE-OUT PRICE - ORDER NOW! Home > Religious Items > Cowboy Up Buckle - FINAL CLOSE-OUT PRICE - ORDER NOW! 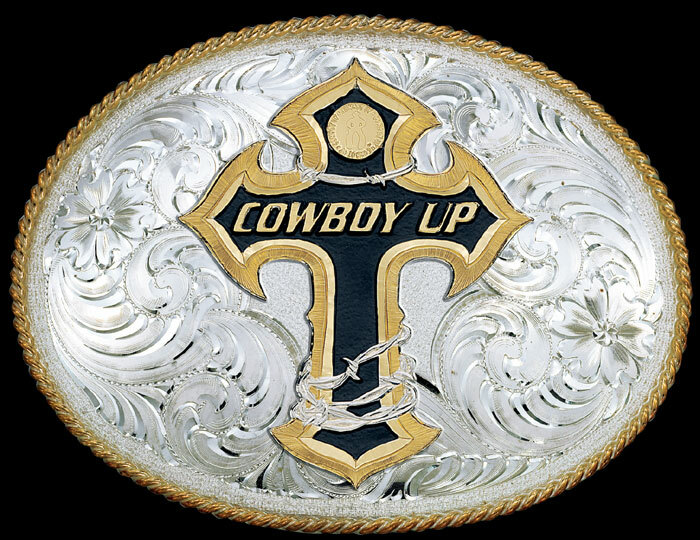 Cowboy Up Buckle by Montana Silversmiths. Large bright-cut western silver buckle features Cowboy Up figure ... or your choice of hundreds of other possibilities from our Figures Catalog. The Cowboy Up Buckle will stay beautiful for a lifetime thanks to its Montana Armor® finish. Fits a 1 1/2 inch wide belt. * Cowboy Up Buckle usually ships 1 - 14 days, or 4 - 6 weeks with a catalog figure. * Made in Montana, U.S.A. 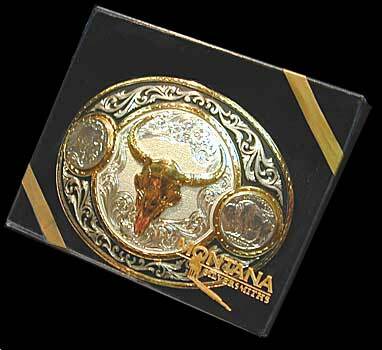 The Cowboy Up Buckle arrives in a nice gift box, ready for presentation or gift giving. The proprietary Montana Armor® electroplate finish of Montana Silversmiths belt buckles -- including the Cowboy Up Buckle -- will not tarnish. All Montana Silversmith belt buckles have a lifetime guarantee against defects and workmanship. They are die-struck from hand engraved masters and finished with silver and gold electroplate and the state-of-the-art Montana Armor ® tarnish protection. These are true heirloom buckles, built for generations. "Montana Silver," as it was known in the early years, is protected by Montana Armor®, a Montana Silversmiths technological breakthrough in 1988. This durable finish gives all Montana Silversmiths products (like the Cowboy Up Buckle) superior protection. Montana Armor® products will not tarnish and the silver's brilliance can be maintained with an occasional wipe with a damp cloth. It's kind of like saying "If you buy our car, you never have to wash or wax it!"